This week it's a very different new product post where we talk about the process of carrying new products. Hello everyone. This week's new product post is going to be a bit different. Last week I mentioned that we didn't have many new products. Instead of rehashing an older product or coming up with some crazy prank, I decided to switch gears a bit and give you some insight into the process of carrying a new product. It takes a lot of people, time, and effort to add each additional product into the catalog. The video this week explains this whole process to give you a brief overview of what it takes to expand our product selection. Vimeo version can be found here. Dozens of people are involved in every new product we carry and there are substantial hours put into each product. The process can be a bit more involved for things we manufacture since that might involve several products which get used in production, multiple prototypes, etc. Also, even though our engineering department is involved in every new product, they are much more involved in products we design. So hopefully that gives you a better idea of what it takes. If you have any questions, post a comment below. We did have a couple new revisions this week, so I'll still stick to the routine and go over those. 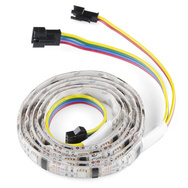 First up, we've got the 1M RGB LED strips back in stock. We had to switch to a different supplier, but they're the same as they were before. If you're not familiar with these, they are pretty cool. You can individually control each RGB LED to make some pretty crazy patterns. They can also be chained together to make some pretty cool displays and arrays. Everyone had some good suggestions for the BMP085, so we decided to make a revision including the feedback. 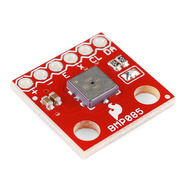 The new BMP085 Breakout Board now uses a 0.1uF cap and has solder jumpers so you can disable the I2C pullup resistors. We even added some mounting holes to make it easier to integrate into a project. Hope you like the changes. And lastly, we have a new revision of our LilyPad ProtoSnap Development Board. We've made the 'snapping' part a bit easier with more holes and a tweak in the dimensions, and are using a new surface mount vibe motor for the vibe board. We're constantly tweaking the design and functionality of the ProtoSnap line. Well, here we are, at the conclusion to yet again another Friday New Product Post. Hopefully you found the video interesting and maybe you were looking forward to one of the revisions above. Thanks for reading and we'll be back again next week with a regular product post. There was a speck of dust on the lens. But very cool! On a similar note, you should have a virtual tour of Sparkfun! I'm pretty much sprinkled throughout. From the start, I'm 'consulted' as to whether or not to carry something. I am also involved in figuring out how many, what color, voltage, etc, or any other associated products we need to carry, etc. I also personally suggest quite a few things that we carry. I enter all new products into the system, create the initial purchases for all new products (which then goes over to purchasing). I verify the product when it comes in and then order which shots our photographer will take. I'm also in charge of verifying all descriptions and product page content and then of course the product videos. So, yeah, I'm kinda on the sidelines for the whole process. All the people shown in the video are people I work with daily on the the various products' lifecycles. That was an excellent behind-the-scenes look at the sparkfun day to day operations. Thanks for the back stage pass. I think a lot of people would be interested in some more extras focused on the diffrent jobs and staff members... I know I would anyway. Using a box for the "product" makes me wish all the more that you sold SFE red boxes! Order more stuff, get more boxes. I order too much, so I get big boxes. I want the small ones. This has come up before, so I emailed customer service. Unfortunately I do not have a way of adding these into an order (no SKU numbers), so let me know when you have a new order number so I can set up the charges for you. Awesome. Do we get a discount if we buy 100+? I want to thank you guys for going the extra step and posting to Vimeo also. For some reason, YouTube chunks a lot where I live and Vimeo is smooth as silk. Cheers! Yeah, and if you follow them on Vimeo it's almost a Thursday New Product post! For some reason it always seems to be uploaded nice and early. I'd love it if you included plain english product descriptions in the write-up. E.g. "BMP085 barometric pressure sensor breakout board"
All of the pov box shots were taken with one of the HackHD Cameras we sell. I don't want to push anyone out of a job, or make a mess of things, but a tiny suggestion: open-source the video. Gift out some new stuff to power users/interested hobbyists/capable folks with a video of what it is and simple uses and the best video is used one Friday. Not that I don't enjoy what you do, but I am just that jealous! this has been discussed in the past, but from the time the new product arrives until we have it on the store is less than a week. just simply mailing something out and giving someone the basic information on how to use it is about the timeframe it takes us to do the whole video and get everything posted. however, we do welcome any demo videos people send in, and typically post them on the relevant products' page. we'll do more demos and pranks in the near future. I've been busy with other projects. example projects from customers is very difficult. how to you propose we go about this? Sunday Product Post: Double Super Secret Post!